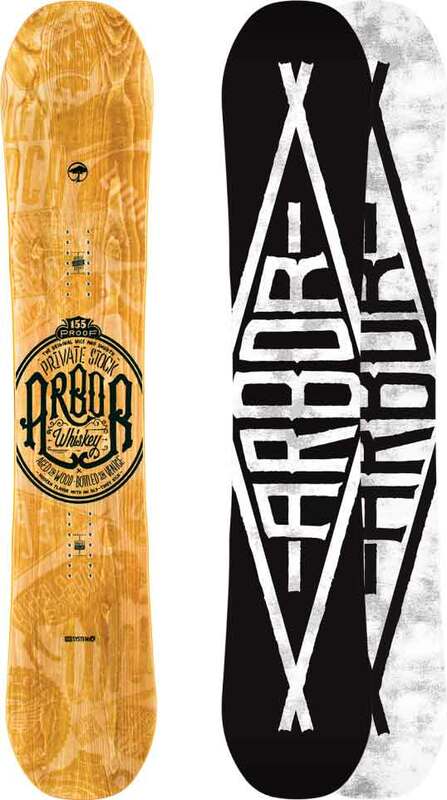 The Arbor Whiskey seems to take a lot of qualities from the Arbor Element and put it into a less expensive price point for the all mountain freestyle rider on a budget. It’s got that Arbor style to it where they make an all mountain flex and then make it a continuous rocker twin with a centered stance. 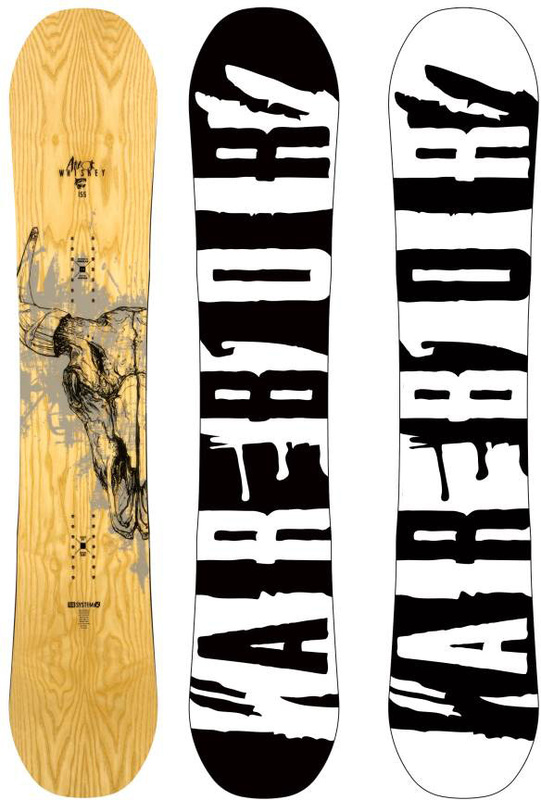 Most all mountain freestyle boards like this these days have a hybrid shape but Arbor is still hanging in there and making continuous rocker work. Not much has changed the last couple of years. Conditions: A little hard snow in the morning leading to perfect soft Sierra snow for the rest of the day. On Snow Feel: So this is the same old same old when it comes to the feel between the feet when it comes to how Arbor’s continuous rocker boards ride. It’s more stable than you would think for continuous rocker but still not there compared to some hybrid camber rides. Powder: No powder but it seems like it would be very similar to the Element in the deep stuff. It would be nice to see a non-camber board from arbor with a setback stance for a more surfy easier floating ride. Everything they have that is rocker has a centered stance. Let’s face it the average rider likes to set it back and ride one direction in powder and Arbor forces a centered freestyle approach to powder with all their rocker boards. Turn Initiation and Carving: If you ride softer continuous rocker boards all the time you will find this a great board to lay into a carve. However, if you are more use to hybrid shapes with camber in them you will feel the drawbacks of continuous rocker when leaning into a true hard carve. Short radius turns are quick and snappy and wider radius turns aren’t boring but aren’t very springy either. It’s got a fun playful feel edge to edge for shorter turns though. Speed: This feels a little damper/less chattery than the Element but the slower extruded base isn’t as good when it comes to a long glide down a flat cat track. Still, it’s not bad at all and I made it across a massively long narrow flat cat track without issues. So in flats and long cat tracks, it’s a little slower than the Element but it’s a little more comfortable bombing a steeper hill. Uneven Terrain: If you are out trying to get better and want to ride on a Saturday till close you won’t have as many issues because this deals with bumpy terrain at slower speeds really well. Edge Hold: Same great edge hold that I truly like. Grip Tech offers a perfect balance between solid grip while not being over grabby in softer thicker snow. Flex: Pretty middle ground to the lower end of med/stiff. I’m going to call it Med/Stiff because there is a bit of a difference between this and its cousin the Element. I had more fun buttering on the Arbor Element and Coda and I used the same super easy flex under the foot Cartel Limited binding on all of them. You could still butter with this but it just didn’t flex as much past the continuous rocker as the Element or to a further extent the Coda. Switch: I believe the tail is stiffer than the nose so it’s pretty much perfect either way unless you butter switch. Jibbing: Not an ideal jib board because of it’s bigger sizing and more medium flex. It’s more for the mountain and other places in the park. Pipe: Felt very good in the pipe and was almost as good as the Westmark. The lack of any camber in the profile does make it less fun to drive from wall to wall but if you are not that strong in the pipe (like me) it’s very fun and forgiving. Jumps: There is good spring but with the memory of the Coda in my head from a few weeks back it just didn’t feel anywhere near that world of pop. Pretty easy approaching smaller kickers that I hit and it’s not a bad board to find a kicker or 2 if you see a park. It would have been nice to see a more directional board with a set back in their line. Even a hybrid shape would be nice. Arbor’s rocker boards all have a centered stance and are True Twins or almost True Twins. It would be nice to see something different but the bottom line is it’s a good all mountain freestyle board for those on a budget at just about any level. Even an expert all mountain freestyle rider could appreciate it. We try to get as many images of the Arbor Whiskey, but forgive us if they're not all there.